Ahhhhh Vermont, one of our truly happy places to visit. We usually spend most of our time in the little town of Waterbury, but lately we've been trying to explore other areas which led us to Winooski and lunch at Misery Loves Co. 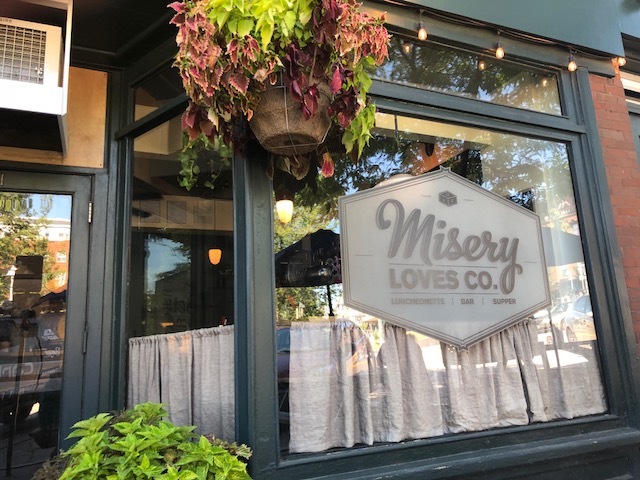 This cute little spot sits on the Main Street of town with a lively, hip interior and more casual picnic style tables out front perfect for soaking up the summer sun. 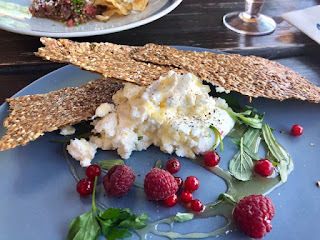 We ordered up a couple of Vermont beers then dove into appetizers; Steak Tartare for me and Fresh Cheese with honey for Mr. T.
The Steak Tartare arrived diced with pickled mustard seeds and grated smoked Vermont Cheddar on top. 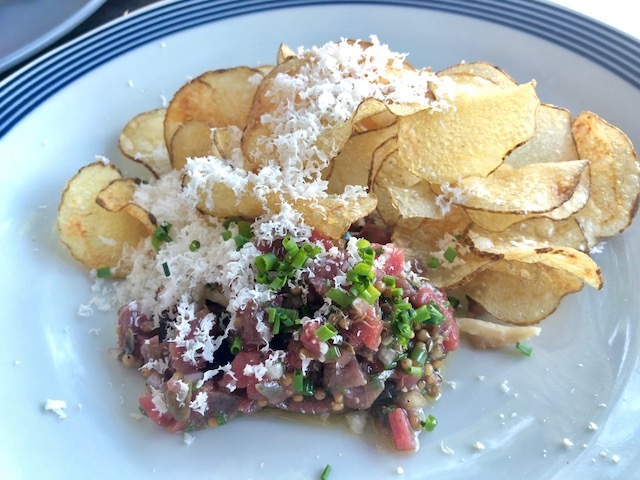 I love a salty potato chip with my tartare and the smoked Cheddar gave the dish a nice creamy, hearty texture. Mr. T's fresh cheese appetizer combined honey and herbed matzo with bright red raspberries that burst with flavors of the season. We decided to split The Rough Francis sandwich for our main; basically an enormous mound of fried chicken smothered in hot sauce with bleu cheese. One of the dishes I miss most from growing up outside of Buffalo is a good Chicken Finger Sub and this sandwich brought me right back to home. 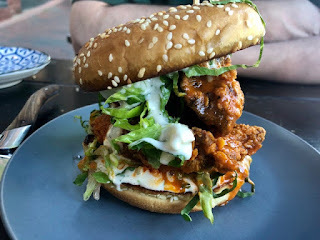 Tender chicken inside, crispy outside with a spicy, buttery sauce that lingered on the lips long after taking a bite. The only forgettable dish were the fries which arrived slightly soggy and over salted. An incredibly small quibble in an otherwise fantastic lunch. 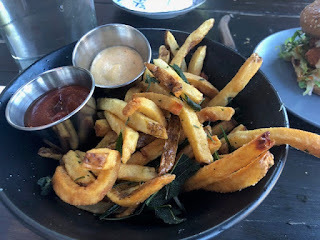 This is a great spot to check out in the Burlington area.